At one time, if you wanted a green, luxury sedan with great gas mileage, you only had a handful of cars to choose from from automakers like Lexus, Infiniti, BMW, and Mercedes-Benz. Now there’s another car to add to your list: the 45 MPG combined, 2013 LIncoln MKZ. Fresh from its official EPA rating, the luxury mid-size sedan manages an impressive 45 MPG all round. That’s 45 MPG City, 45 MPG Highway, and 45 MPG Combined. As MotorAuthority notes, that places the 2013 MKZ Hybrid above the Lexus ES300h and Infiniti M35h in the gas mileage stakes. it also places it above comparable luxury diesels from automakers like BMW, Audi and Mercedes-Benz. Fitted with the same 2.0-liter, four-cylinder engine and 70 kilowatt-electric motor found in Ford’s 2013 C-Max Hybrid and 2013 Fusion Hybrid, the MKZ produces the same combined 188 horsepower as its blue-badged cousins. That might not be quite as much as some of the other mid-size luxury green cars on the market, but it’s certainly enough to give the MKZ adequate performance in everyday driving. 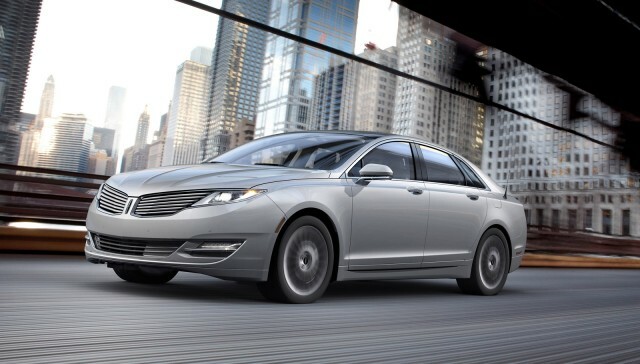 Unlike other luxury automakers, however, Lincoln--Ford’s luxury arm--offers the MKZ in hybrid form at no extra cost. At $36,800, including destination, the base-level MKZ Hybrid should become one of the most financially attractive--and most efficient--mid-size luxury cars on the market when it goes on sale later this year.